When I think to favorite breakfast treats, cinnamon rolls immediately jump out. They’re my number one. Why am I mentioning cinnamon rolls in a biscuit post, you ask? Well, as much as I like eating cinnamon rolls, making them the right way requires preparation and patience -- two things I often find myself short on. Enter: biscuits. Oh, sweet, sweet biscuits. The efficient-while-still-looking-impressive way to a delicious breakfast. They can be dressed up with sweet toppings like honey or the rhubarb jam I share below, eaten straight up with a little pat of butter, or they can easily swing into savory territory with inclusions of cheddar cheese and chives and serve as a glorious bookends to a hearty breakfast sandwich. 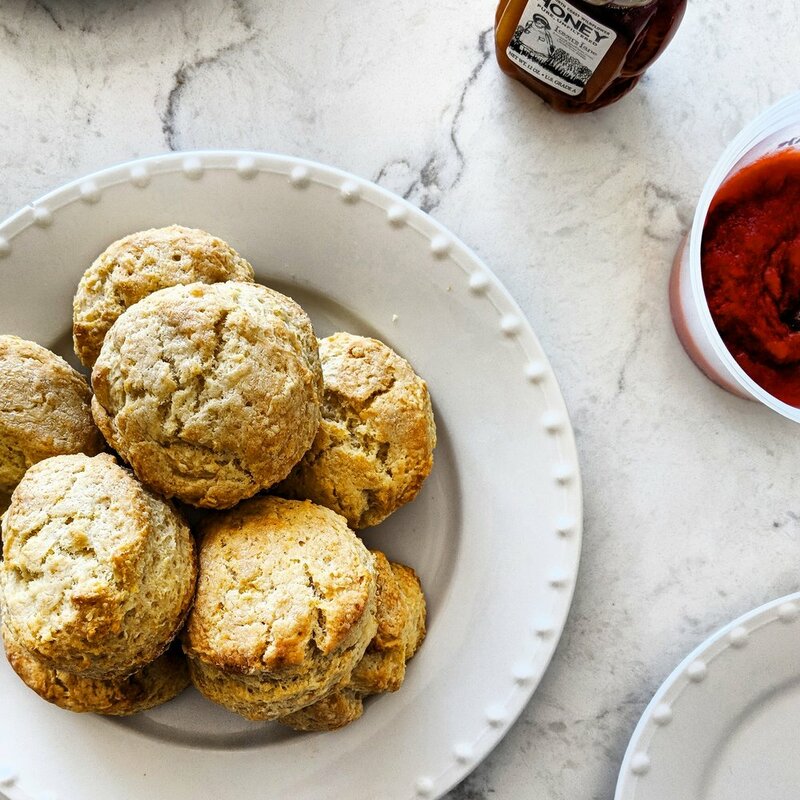 While I recommend you make this jam ahead of time, I am including the recipe here below the biscuit one because I particularly like how the tartness of the rhubarb plays off the buttery goodness and (slight) tanginess of these biscuits. Don’t want to make your own jam? Then don’t! You do you. In a large mixing bowl, whisk together the flour, baking powder, baking soda, and salt. I cheat and use my hand for this step - one fewer dish to wash.
Cube your butter straight out of the fridge, add it to your flour mixture, making sure each cube is coated in the dry ingredients. Dump your mixture onto a clean countertop / surface and start smearing the butter with the palm of your hand, pushing the mixture away from you, causing the butter to both break up and form thin streaks. This method is called fraissage - check out THIS video for what it looks like in action. I was first exposed to it in pastry school and became a huge fan for biscuits (and pie) because it doesn’t require any equipment and it produces extreme flakiness. Once you’ve pushed the pile away from you by smearing each piece of butter, scrape together the mixture so it’s in a nice pile close to you again and repeat the same steps 3-4 times until the largest pieces of butter are broken up into small (dime-sized) pieces. Put the mixture back into your mixing bowl and pour in the buttermilk. Before you dirty your hands up again, sprinkle flour on the surface your were just using to fraissage. Next, pretend your hands are salad utensils tossing a salad and gently incorporate the buttermilk with the flour+butter mixture until the liquid is incorporated. Beware: this is a sticky dough! Dump the dough onto your floured surface and pat out with your hands into a rectangle until it’s about an inch thick. At this point, use your bench scraper to cut your rectangle in half and stack one piece on top of the other. Repeat this process of patting down / cutting in half / stacking 4-5 times -- this ensures distinct layers in the bake! On your final pat down, ensure your dough is ~¾” thick, and use a biscuit cutter to cut out round biscuit. After cutting out your first round, carefully reassemble the remaining dough, pat it down again, and cut additional biscuits until you’ve used up everything. Using a 2” biscuit cutter, I get 8-9 biscuits. Out of buttermilk? Use whole milk instead and omit the baking soda. Note: I’ve made this with and without the small inclusion of strawberries; if you skip strawberries, simply use the weights listed for rhubarb and strawberries entirely in rhubarb instead. Both options are delicious! Combine chopped rhubarb, sugar, water, and lemon juice in a bowl and let sit for 1 hour. Place macerated rhubarb mixture into a medium saucepan and bring to a boil over medium-high heat. Using an immersion blender, pulse the jam mixture until the rhubarb is no longer in big chunks. Do this step carefully since the mixture is very hot! Cook the mixture for 15 minutes at medium-high, stirring with a heatproof spatula the entire time. This prevents scorching/burning the rhubarb. Continue cooking on medium heat for an additional 30 minutes. You don’t need to stir constantly at this point, but keep stirring every minute or so to keep preventing scorched jam. Next, test the jam for doneness by taking a tiny spoonful of it and putting it on the plate you had in the freezer. If the jam holds it place on the plate, then you’re good to go. Otherwise, give it another 5 minutes and test again. Add vanilla extract and pinch of salt at this point. Let jam cool off the heat but still in the saucepan; once it’s cool enough to taste, taste it. If you want more vanilla/salt/lemon juice, add it now. Let jam cool completely. I don’t fuss with the whole glass jar canning process for a small batch like this, so once it’s cooled, place jam in a plastic container and keep in the fridge for 1-2 months.